The GNOME desktop community has been evaluating different CMS options since July. 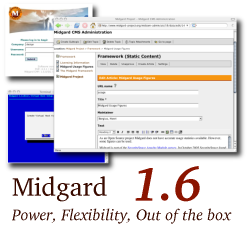 TikiWiki, Drupal and eZpublish were eliminated because of missing features, and the final was between Plone and Midgard CMS. The reasons for choosing Plone rely more on people than code, since both tools could reach all the requirements with hacking and good will. Please, please do not run GNOME.org on Plone. I cannot stress this enough. Not only is Plone remarkably slow (it brought a dual Pentium 3 to its knees), it’s hard to hack on and hard to understand, it behaves more like a document management system than an exciting website and is unstable to boot. From what I’ve seen, Plone is a quite nice system. But the big question is whether you want the Zope infrastructure or something else. In any case, while I’m a bit disappointed on the decision, I will watch the deployment project with interest. Especially the concept of using PO files for site content localization is something that could be worthwhile to implement if the process actually works as well as the GNOME i18n guys claim.